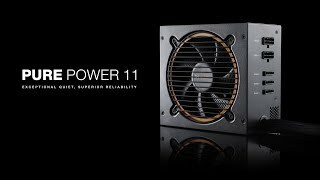 PURE POWER 11 | 400W silent essential Power supplies from be quiet! Pure Power 11 400W offers peerless dependability and best-in-class features. Whether you’re assembling a very quiet system, building a multi-GPU gaming system, or upgrading an existing PC, your build will benefit from this PSU that simply has the best combination of features at a very popular price. Pure Power 11 400W is certified 80 PLUS Gold with an efficiency rating of up to 92% – a truly outstanding level for this class of PSU. The most compelling benefit: lower power consumption and consequently lower costs, and cooler, quieter operation. Pure Power 11 offers 400W of continuous power with two independent 12V rails for signal stability and two PCI express connectors for multi-GPU systems. It is suited to very quiet systems, for upgrading or building multimedia or multi-GPU gaming systems. 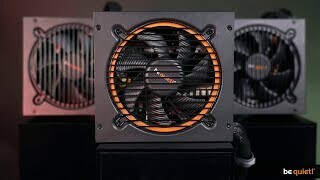 Pure Power 400W is exquipped with high-quality sleeved cables that simplify component installation, increase airflow and improve cooling. The All-in-one cable has a convenient easy-plug HDD connector.